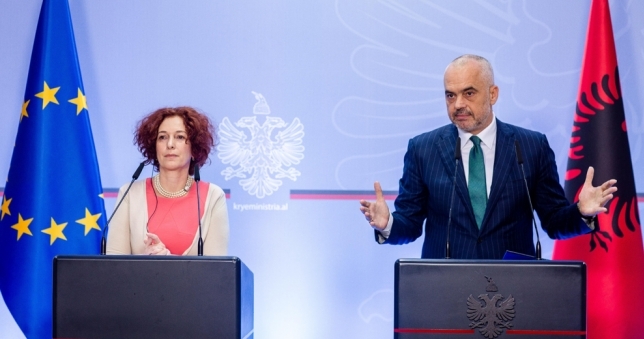 EU Ambassador Romana Vlahutin and PM Edi Rama. Source: Kryeministria. German newspaper Frankfurter Allgemeine Zeitung published yesterday an article by Karl-Peter Schwarz, one of its editors, about the recent political developments in Albania, including the implementation of the judicial reform. The article, among other thing, explains that one of the main elements of the reform is the vetting of the judges and prosecutors, performed by a set of institutions containing a total of 27 members. The activity of these vetting institutions will be monitored by a team of international observers, who will guarantee that the vetting will not be used politically. The Ambassador of the EU, the Croat Romana Vlahutin, have been confronted with a corruption case, made public by the Albanian media, in relation to a luxurious villa of 600 sq.m. acquired by the EEAS as residence for the ambassador. The villa, in the exclusive compound Rolling Hills, was bought for €1.65 million, a price twice higher than the market value in the same compound. Ingeborg Gräßle (CDU), Chair of the Budget Control Committee of the European Parliament, is currently investigating the acquisition of the villa. She has declared that the case has heavily damaged the image of the EU. The Albanian opposition suspects that Ambassador Vlahutin, former employee of the socialist Croatian president Ivo Josipović, works in the favor of the socialist prime minister Edi Rama to direct the judicial reform in his favor.